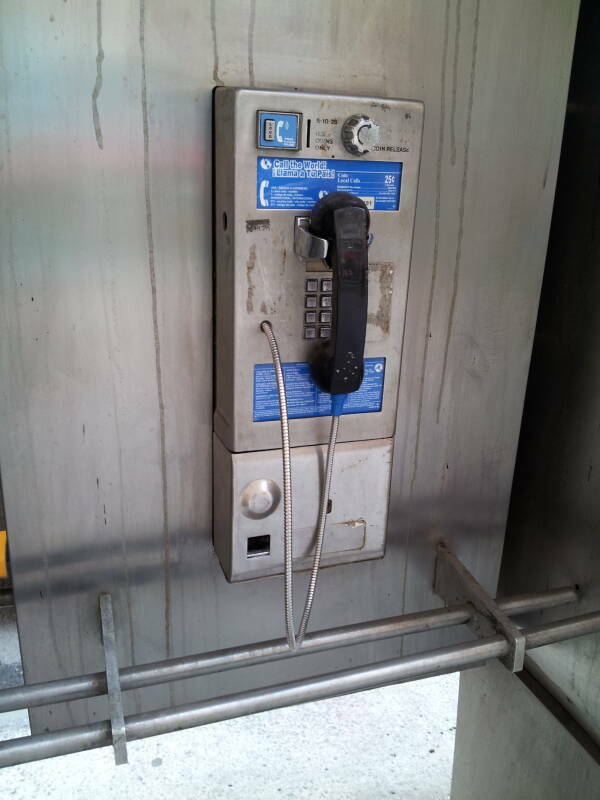 The coin-operated public pay phone is a dying breed. Actually, it is mostly dead already. The few remaining examples are being replaced. We can say that it is dying only to the very limited extent it is not completely dead already. 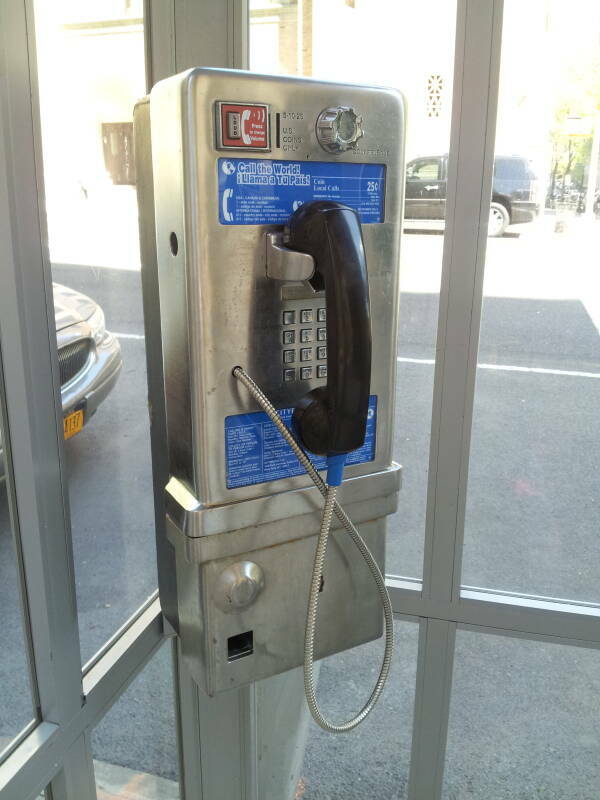 Who still needs a public pay phone, besides the person calling to report that their mobile phone was just lost or stolen? 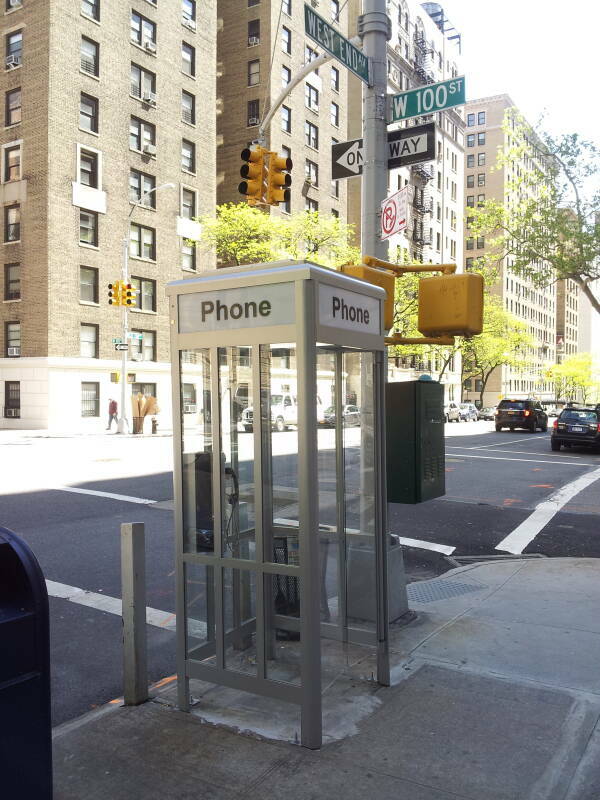 By the spring of 2016 there were only four enclosed payphone booths left in all of Manhattan. Meanwhile their brethren in shells extending down only to waist level were being replaced with Internet data nodes that could do something as quaint as a voice call if you really wanted to. Sound! Over a wire! What hath God wrought? The main purpose of these replacements was to provide public Internet access. 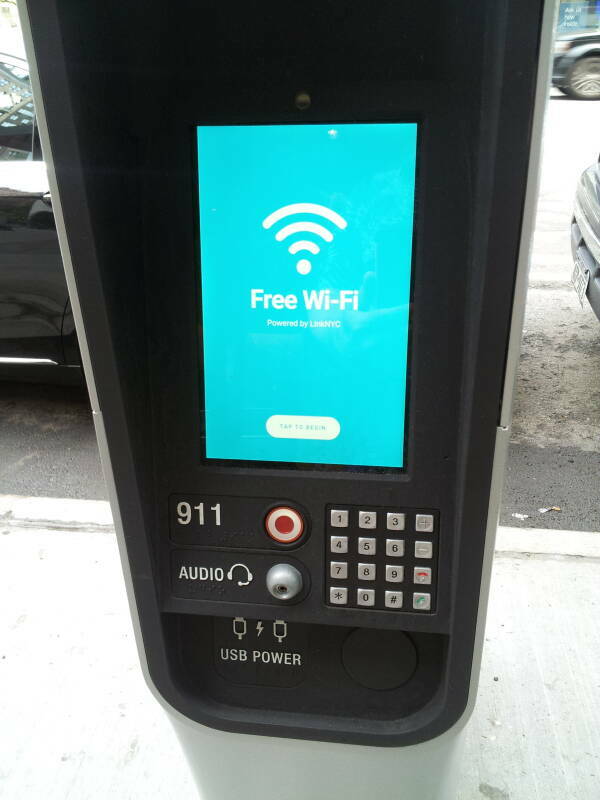 A terminal for searches and maps, plus standard USB connectors to charge personal phones or other devices, plus a Wi-Fi Internet access point so people could connect to the Internet as they walked down the sidewalk or sat in a nearby coffee shop or apartment. 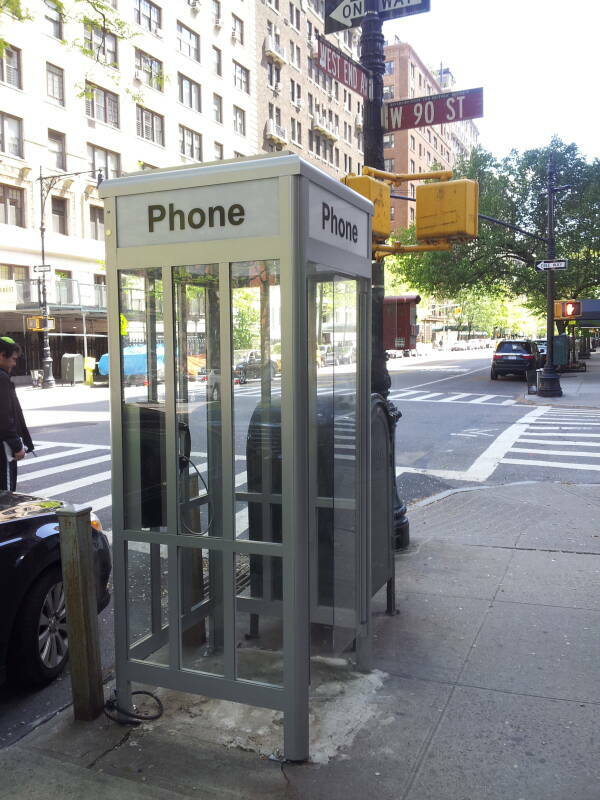 Here are the last four full-height "Superman-style" phone booths in Manhattan, and a few of their almost as archaic sidewalk brethren as they started to be pulled out and replaced with the new LinkNYC system. 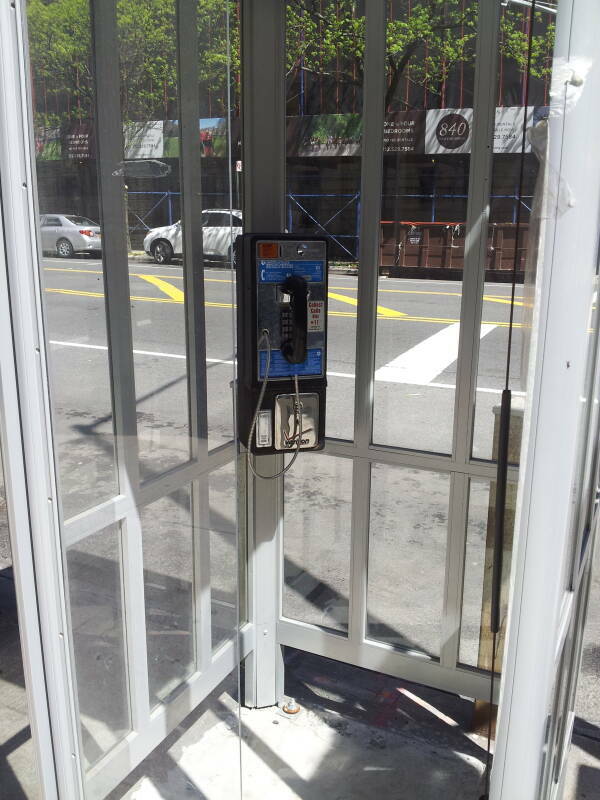 The last four full-booth pay phones in Manhattan were along West End Avenue on the Upper West Side, at 66th,, 90th, 100th, and 101st Streets. I'm walking south on West End, approaching the northernmost one. See it ahead on the next corner? 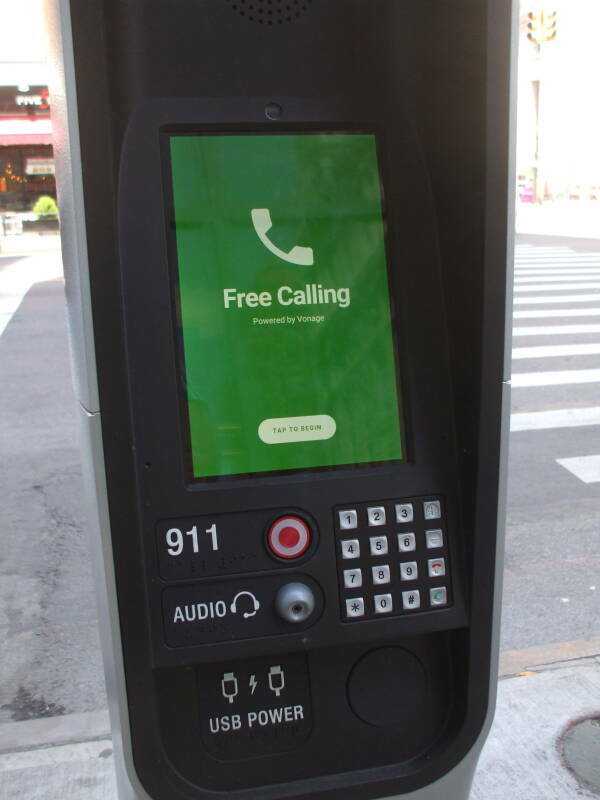 A plan was announced in November, 2014 to replace all public phone booths with a system combining a Wi-Fi hot spot, free Internet access, free domestic calls with a cellphone or built-in keypad (through a partnership with Vonage), access to city services and directions, and a USB charging station for mobile devices. A red button provides a simple way to contact 911 in the case of emergencies. The system will be funded by advertising panels on two sides of each unit. It is expected to generate at least $500 million in revenue for the city over the first 12 years. The system is LinkNYC, run by a consortium including Qualcomm and Titan. The Wi-Fi range is to be about 50 meters supporting up to 250 connected devices. 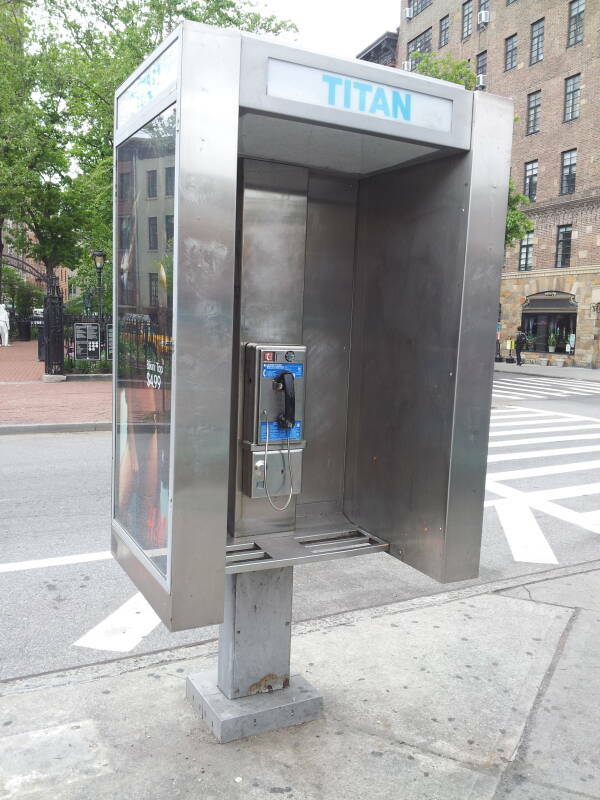 In late 2014 there were about 8,400 pay phones in the city. The project is hoped to install about 10,000 of these communication kiosks or "Links", each about 9.5 feet tall and less than a foot thick. Let's continue to the northernmost booth, at 101st Street. These last four surviving full height booths do have doors, although they're simple hinged plastic panels without frames. They're Plexiglass or Lexan sheets about 3/16" or 4.5–5 mm thick, hinged to freely swing both in and out. There's no metal frame designed to keep the door panels rigid but frequently jumping out of its track and jamming and making for extra struggle letting yourself in and out. But it is a full height phone booth with doors, in which you can adhere to tradition by entering, pulling the doors shut, and urinating in a slight degree of privacy. Er, making a phone call, that is. But have you ever smelled the inside of a traditional phone booth used in the traditional fashion? More than phone calls happened in there. 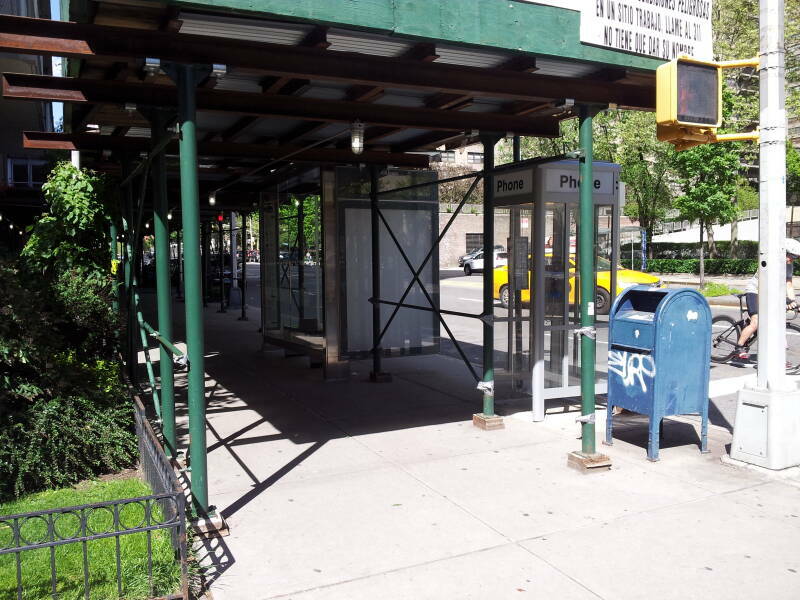 The large gap between the sidewalk and the bottoms of the panels and doors provides constant ventilation and makes it more effective when the city or the phone company comes around with a high-pressure hose to clean the booth. It's just a block to the next one, at 100th Street. Each of these is on the northwest corner of its intersection. Stan Lee's birthplace is close to here, at West End Avenue and 98th Street. The work in February 2016 included replacing some battered older booths. This wasn't going to be easy. 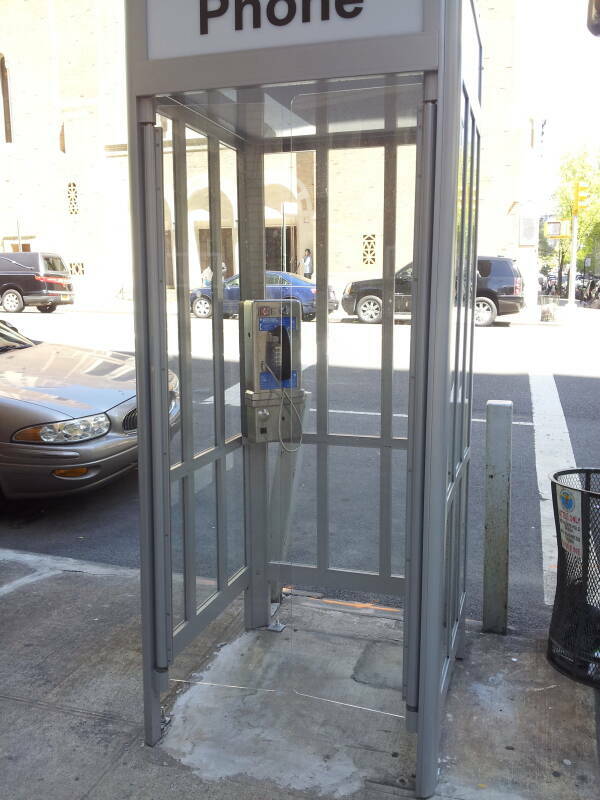 In 2003, the city had needed to replace the booth at 100th Street. Verizon said that they had just two full-height booths left, and they used both to rent out to film companies. 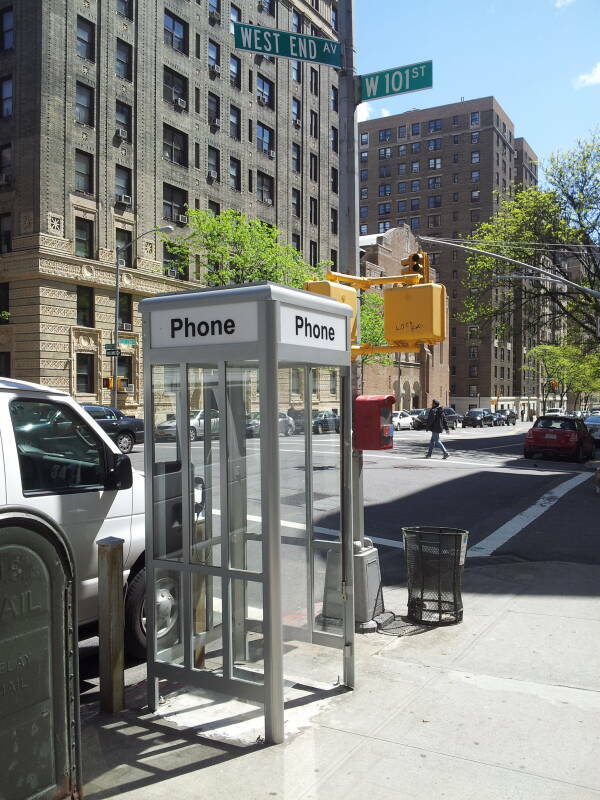 One of those two replaced the booth at 100th Street, and they realized that the other had been destroyed while filming the thriller Phone Booth. 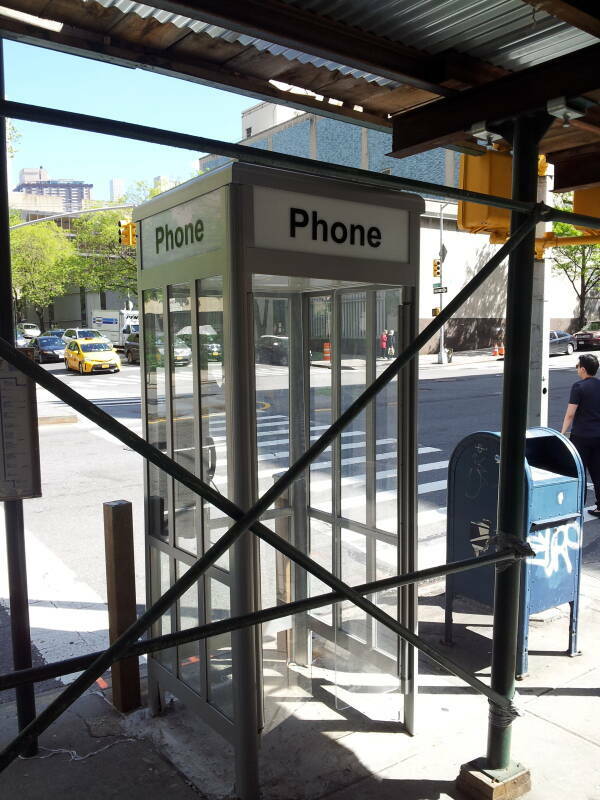 Verizon contacted Clark Specialty in Bath, New York, a company that has manufactured and refurbished phone booths. But Clark Specialty had sold the last of their stock over 10 years before to military bases and collectors. They eventually tracked down a warehouse in Canada with several phone booths in bad condition. They bought four of them, disassembled them, and replaced the transparent panels. The tracked doors were removed and replaced with the simple hinged panels. In the beginning there were pay stations, company-owned phones you could use and then pay an attendant. The Connecticut Telephone Company is said to have had one of these in their New Haven office in 1880. By 1889 the Hartford Bank, also in Connecticut, had a public phone with a mechanism to pay with coins. 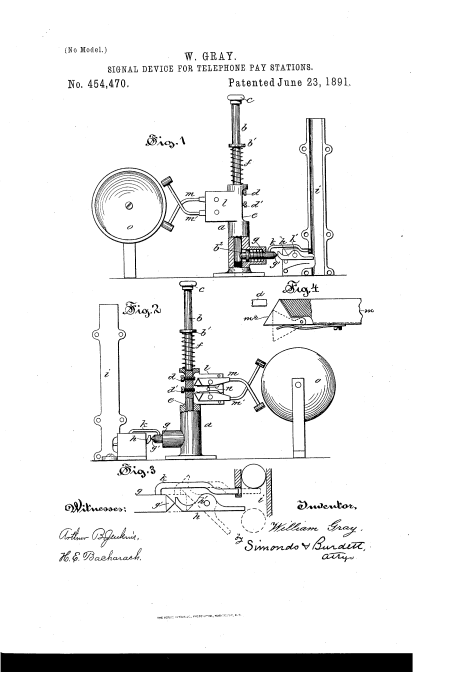 U.S. Patent 454,470 was issued for a coin pay mechanism that rang a bell for each coin deposited. There were 81,000 pay phones in the U.S. by 1902. 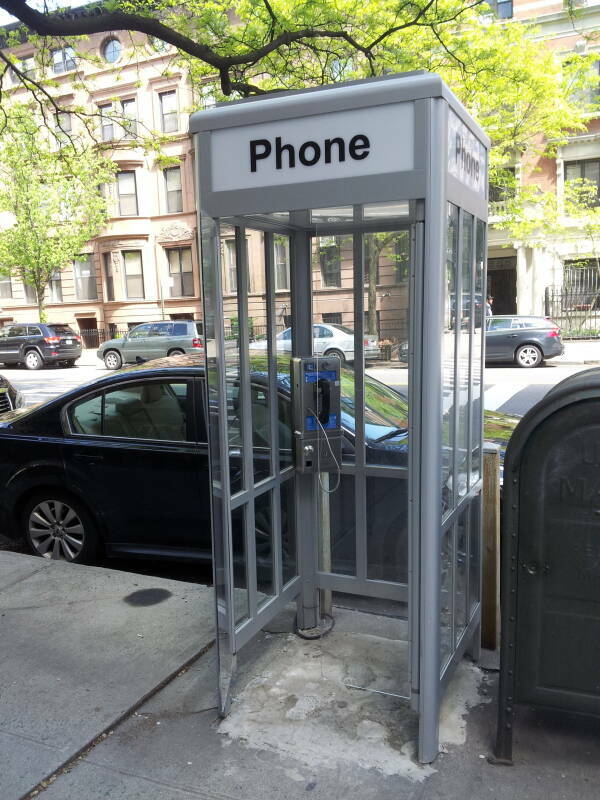 The first outdoor pay phone in a booth was installed in 1905. There were 25,000 of these booths in New York City by 1925. Pay phones kept multiplying. The Bell System installed number one million in 1960. The peak? It depends on who you ask, the numbers are conflicting due to the division of AT&T in the 1980s. Maybe 2.6 million in 1995, or 2.2 million in 2000. 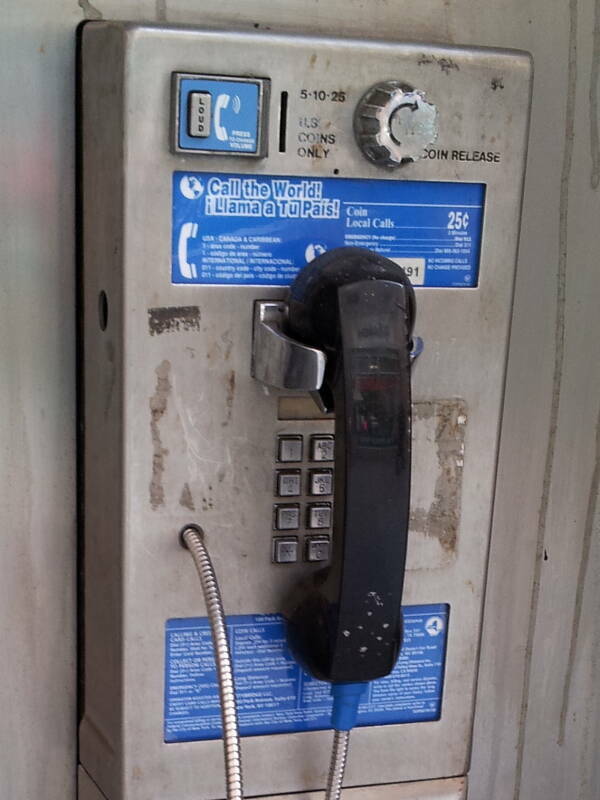 The FCC mandates a fee for calls placed from a pay phone to a toll-free number. 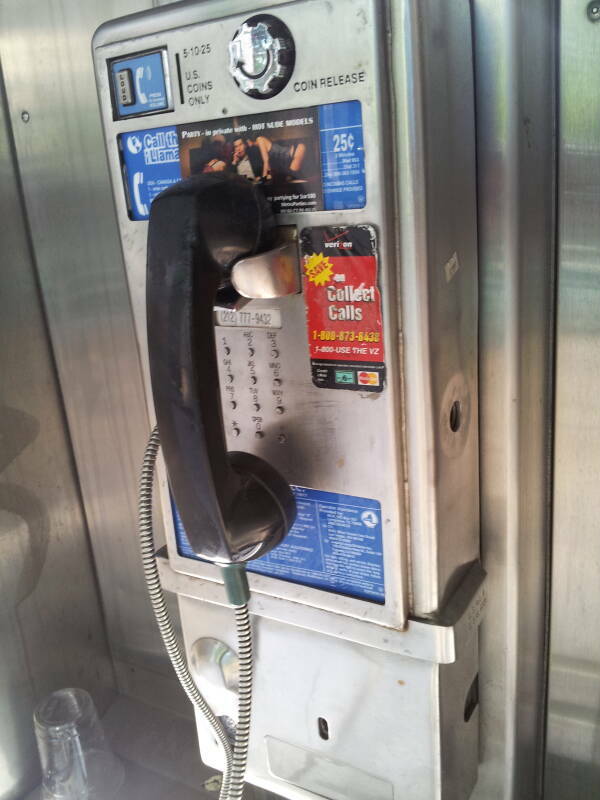 The owner of a toll-free number must pay 49.5¢ for each call successfully placed from a pay phone. Many owners of toll-free numbers reject attempted calls from pay phones. As for calling cards, most charge either $0.50–1.00 (or more) or a number of extra minutes equal to (or larger than) that surcharge for each call placed through a pay phone. 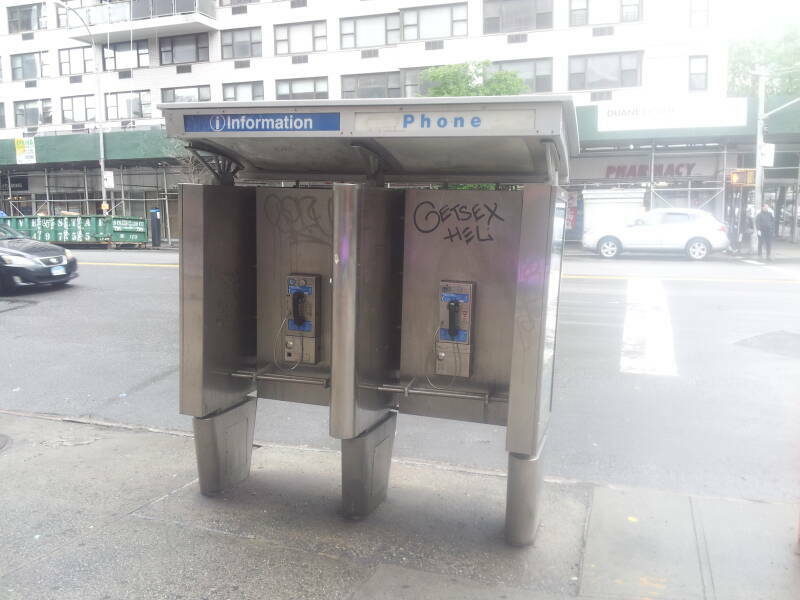 Surcharges and filth made pay phones less attractive. Then mobile phones made them irrelevant. The pay phone numbers started dropping quickly. AT&T officially stopped supporting the public pay phone system in 2009, and Verizon mostly quit in 2013. There were less than 500,000 left by 2013. Now we'll continue south on West End Avenue to 90th Street. West End Avenue and 66th Street is behind the northwest corner of the Lincoln Center complex. This is the southernmost of the last four full-size booths. Below are some examples in kiosks. The small side panels support some advertising income, but they block almost no background noise. The phones shown so far had the traditional square buttons. But the last one above appears at first to have no buttons. Vandalism? No, it has small pin buttons, an attempt at a more durable design. See a closer view of one of these pin-button phones below. Now we get to the first of the LinkNYC panels. The one seen below is on 3rd Avenue just south of 14th Street. 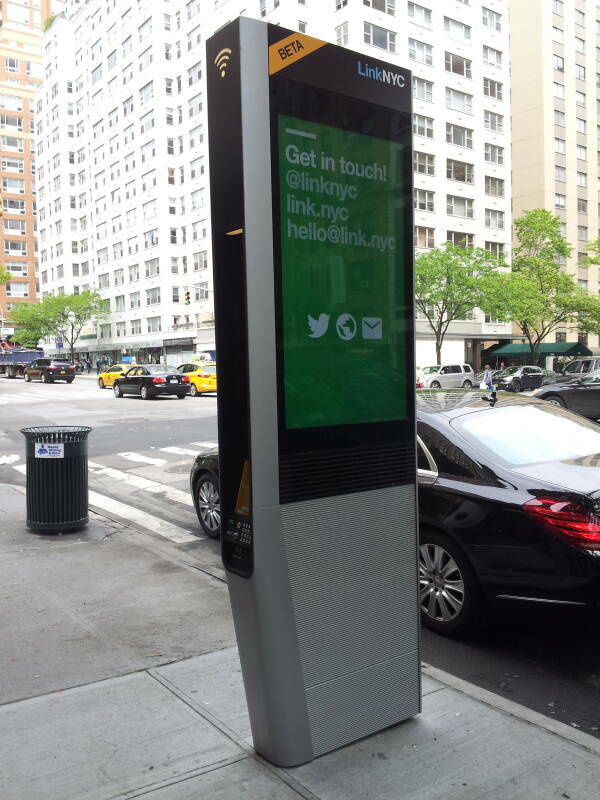 The LinkNYC project started here, moving north on 3rd Avenue from 14th Street. This was probably the first one installed. 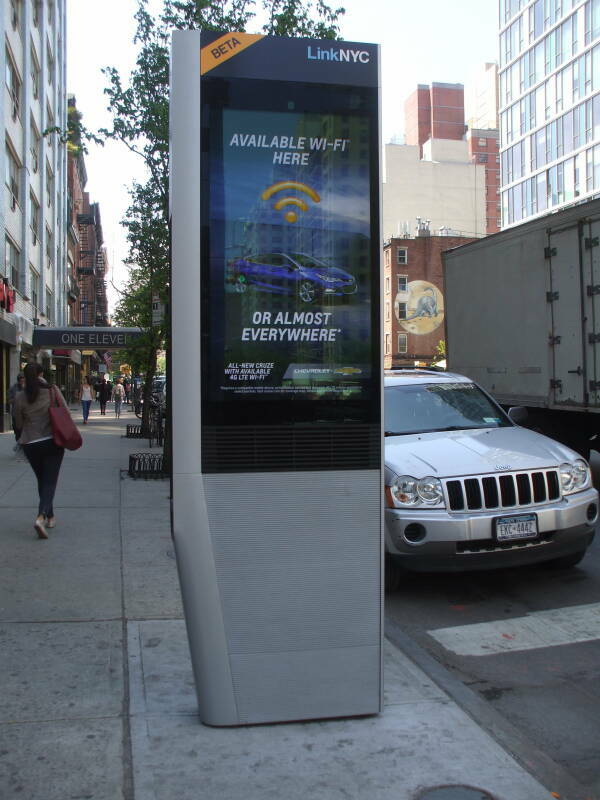 LinkNYC aims to be the largest and fastest public Wi-Fi network in the world. It started in Manhattan but will cover all five boroughs. The contract was awarded to the Citybridge consortium, made up of Qualcomm, Titan (who had been operating many, perhaps the majority, of the pay phones), Control Group, and Comark. In June 2015, Titan and Control group merged into Intersection, and was acquired by a group of investors led by Sidewalk Labs, the "urban innovation organization" of Alphabet Inc., the parent company of Google. 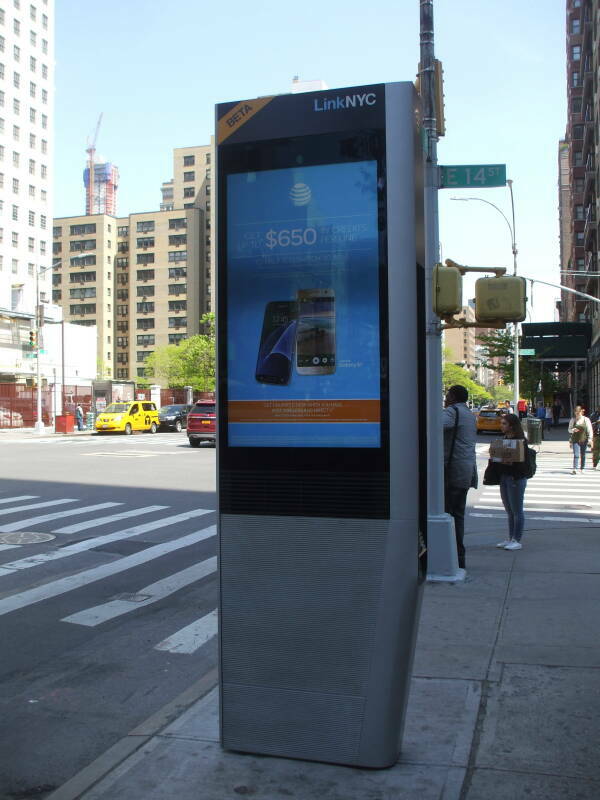 The kiosks, called Links, are designed to support encrypted Wi-Fi to a 50-meter range. At least at first, encryption is only supported with devices running Apple's iOS. So be careful to use TLS and SSH. The Links use Qualcomm's Vive 802.11ac Wave 2 4x4 chipsets. IEEE 802.11ac operates on the 5 GHz band, 5.170–5.835 GHz. It provides multi-station WLAN throughput of at least 1 gigabit per second, and single-device throughput of at least 500 megabits per second. It accomplishes the high throughput through a wider RF bandwidth, 80 MHz for stations and up to 160 MHz optionally, up to eight MIMO spatial streams, and high-throughput modulation up to 256-QAM. 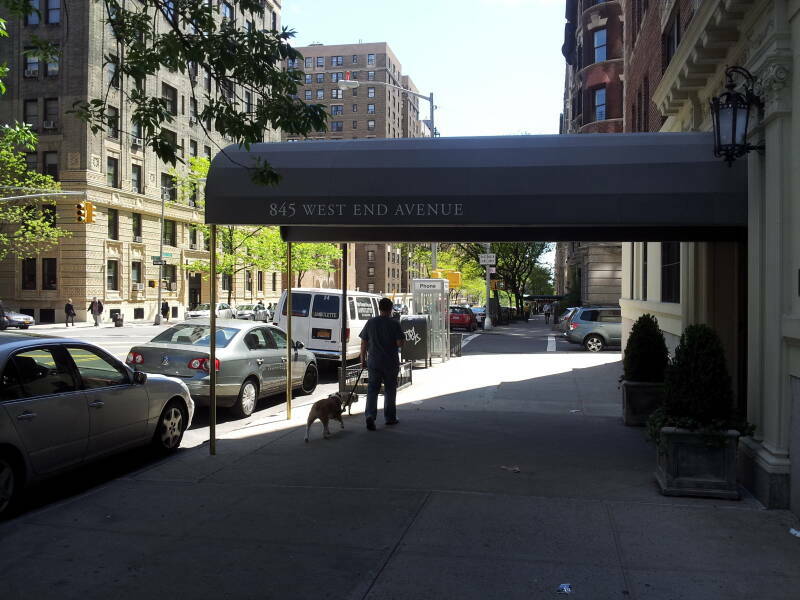 The last two pictures here are from the Upper East Side, on Third Avenue around East 70th Street.